Ingredients: Enriched Macaroni (Wheat Flour, Niacin, Ferrous Sulfate, Thiamine Mononitrate, Riboflavin, Folic Acid), Cheese Sauce: Water, Cheddar Cheese (Pasteurized Milk, Cheese Culture, Salt, Enzymes), Partially Hydrogenated Soybean Oil, Nonfat Dry Milk, Whey (from milk), Natural Flavors, Sodium Phosphate, Salt, Lactic Acid, Mono- and Diglycerides, Annatto Extract and Oleoresin Paprika (color), Sodium Alginate, Xanthan Gum. Stir macaroni into 6-cups boiling water. Boil rapidly, stirring occasionally, 10 to 12 minutes or to desired tenderness. Drain macaroni (IMPORTANT: Do Not Rinse) and return to pan. 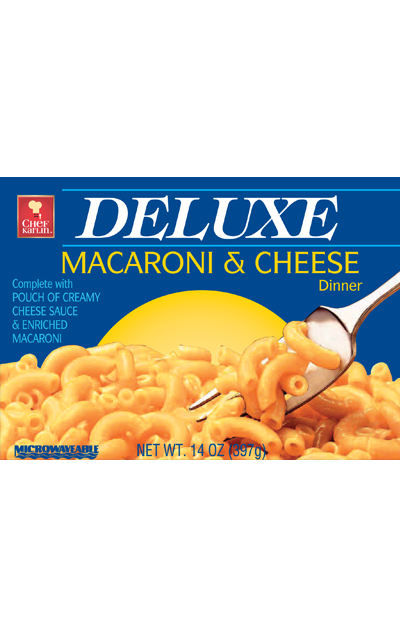 Cut open cheese sauce pouch and squeeze onto hot macaroni. Mix well until cheese sauce is melted and well blended. In a covered 2-quart microwaveable casserole, microwave 3-cups water on HIGH 4 to 6 minutes or until boiling. Microwave on HIGH, uncovered, 10 to 12 minutes, (stir every 4 minutes) or to desired tenderness. Drain macaroni and return to casserole.